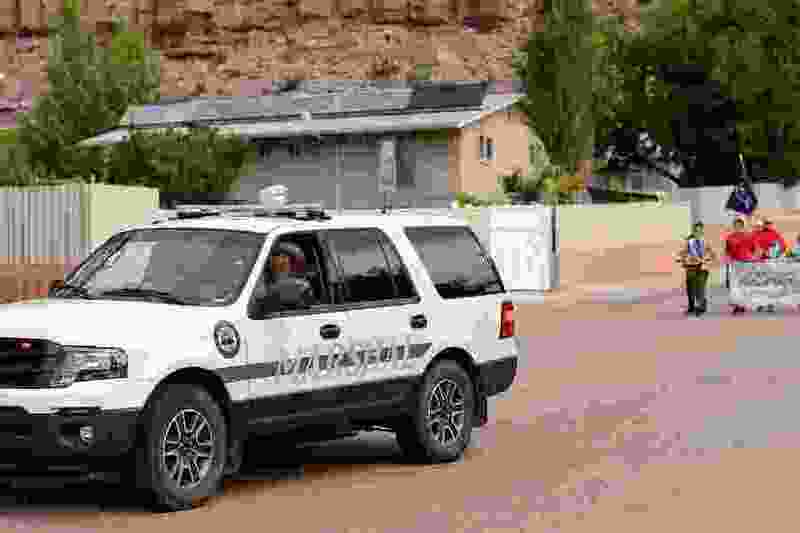 The towns of Hildale, Utah, and Colorado City, Ariz., on Thursday hired the police chief who will oversee what’s supposed to be a more secular police force. Mark Askerlund, who began his career in 1982 at the Salt Lake City Police Department (SLCPD), will head the police force for the two communities, according to a news release from both cities. (Rick Egan | The Salt Lake Tribune) Cottonwood Heights Police Sgt. Mark Askerlund, in his police truck, Monday, October 3, 2011. Mayors for both towns recommended Askerlund after a monthslong search. The new chief could be one of the biggest changes yet for government in Hildale and Colorado City, collectively known as Short Creek and home to the polygamous Fundamentalist Church of Jesus Christ of Latter-Day Saints. A federal judge has ordered changes in the two towns and a monitor and police consultant for its municipal governments and the marshals. The job of replacing the chief fell to the towns’ monitor and police consultant appointed by the judge. When internal candidates weren’t qualified, the monitors began advertising the position on police websites. One ad says the post offers a salary of $5,700 to $6,700 a month and the chief must live within 35 miles of Short Creek within six months of starting. The two city governments still need to ratify the hiring. Askerlund also will have to continue working with the monitor and police consultant to introduce new policies and procedures to eliminate bias while protecting a community with some unique characteristics. Askerlund retired from SLCPD in 2006 and went on to Cottonwood Heights, where he helped the city form its police department. He has held a number of police jobs, including patrol, SWAT, vice unit and investigations, according to the news release. “He has expressed his commitment to help bring about unity in the communities and develop good working relationships with surrounding law enforcement agencies,” the cities said in the release. Staff writer Paighten Harkins contributed to this story.